RICHARD NOWAK FINE ART: Had a great time teaching last night at Westfield Creative Arts at my Acrylic Painting Class! Three students attended. Gloria fished her wooden bridge painting, Scott started a Manet floral painting and Phyllis finished her autumn tree landscape pictured below. This was her second painting and she did terrific!! Had a great time teaching last night at Westfield Creative Arts at my Acrylic Painting Class! Three students attended. 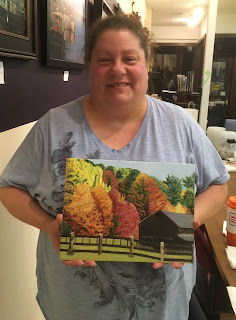 Gloria fished her wooden bridge painting, Scott started a Manet floral painting and Phyllis finished her autumn tree landscape pictured below. This was her second painting and she did terrific! !